Whatever the prevailing wind, Anvil have always been unyielding. 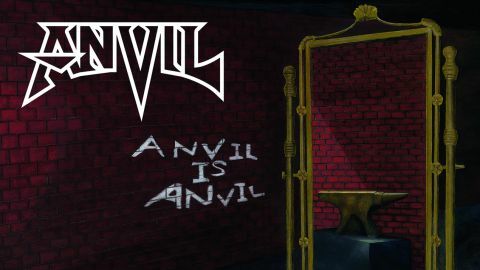 You know what to expect from any of their albums, and anything on Anvil Is Anvil could be swapped for tracks from their classic early 80s period without disturbing the flow. And that’s why this is such a metal testament. The band’s style has always been proto-power metal, their brushes with brutality liberally laced with enthusiastic riff punches that nod towards Motörhead and Priest. But what makes the album work is that there’s an unconditional freshness about the band. They race into every track with such zest and command that you’re soon totally immersed. From the humour of the pirate metal romp Daggers And Rum through the socially aware Gun Control, the storming It’s Your Move (with a deliberate bow to Ace Of Spades) and the martial Forgive Don’t Forget, the record is stuffed with fire, ire and what can only be described as classic Anvil moments. There’s no attempt to appeal to a new audience, no compromise for the commercial good. This is Anvil, unreconstructed, led from the front by Lips, with his barking vocals and yelping lead guitar breaks. A cracking ride.